Short and slender women are suitable to wear small and simple jewelry, avoid taking necklaces, earrings, brooches, bracelets and belts together, try to wear some shoes with a heel and don’t take neck and hand ornaments, you might try to wear some cute earrings, unique rings and hair accessories, if you have to wear a necklace , you should choose some fine metal chains instead of pendant necklace. 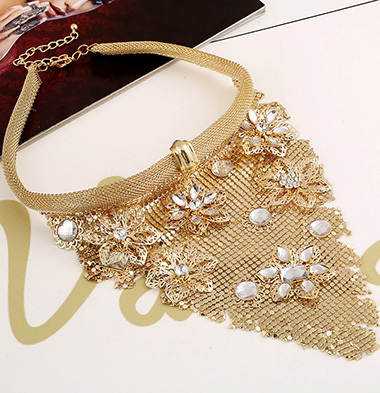 As for women whose body is partially fat and chest is too large should choose elongated hanging ornaments and the necklace is better 60-70 cm in length, so that it will form a "V" shaped pattern to make you look slim in a certain extent.Long drop chain necklace is fit. In addition to the body, you face also should be considered when wearing jewelry, if the collocation is appropriate, you will receive unexpected good effect. If your cheekbones are higher, then choose small earrings, preferably bead-shaped or round, to make the face look softer contours. For people whose face is mediocre and unattractive, try to divert people attention when choosing jewelries, for example, if wearing a bright statement necklace that have big pendant will play the effect well. People with not good nose or chine should avoid large, eye-catching fancy earrings, because they will highlight the weaknesses . Bespectacled lady should note that no matter how simple your glasses are, the glass is always shining light, and so it's best to wear only one pair of earrings or a bracelet, never take both earrings and other jewelries, such as necklace, bracelets, brooches and so on. If you have a slightly sagging double chin, or neck muscles have wrinkles, it is best to choose to wear a pair of large statement earrings, so that people's attention can be shifted to other parts of the face.